Iris Lockhart receives a phone call from a psychiatric hospital informing her that she's been given power of attorney over her great-aunt, Esme, who has been a "resident" of the hospital for 61 years. But Iris has never heard of Esme Lennox, who is supposedly her grandmother, Kitty's sister. Her grandmother now has Alzheimer's and her father is dead. The hospital is closing and Iris doesn't know what to do with this woman who may be out of her mind. In The Vanishing Act of Esme Lennox, Maggie O'Farrell creates a haunting story of a girl who was locked away in an institution at the age of 16. Esme's life before her institutionalization is revealed slowly through Esme's thoughts and those of her sister, Kitty. Iris's own story is intermingled with that of her great aunt. I love how O'Farrell shows the similarities between Esme and Iris in the way they rebel from societal rules. Esme does so through her disregard for the proper dress and formalities of her time. Iris does so through her clandestine relationships with her stepbrother and a married lawyer. I read somewhere a comparison of the style of this novel and that of Rebecca by Daphne du Maurier. I have to say I agree in terms of the feeling the stories evoke and the way each author takes the mystery straight through to the last page. But readers of my blog may remember I didn't like Rebecca at all; yet, I loved The Vanishing Act of Esme Lennox. I think this is because I felt so strongly for the characters in this novel. And O'Farrell, while she presents many of Esme's and Kitty's thoughts in a stream-of-consciousness way, kept the story moving forward. I didn't feel that the descriptions were dragging the story at all. I highly recommend The Vanishing Act of Esme Lennox to anyone who enjoys mystery and literature. I read it in just two days ~ I had a hard time putting it down as I was anxious to see how Esme ended up in the institution, and what was going to become of her in the end. I look forward to discussing this one with my book club group as I think there will be plenty of topics to cover. With that in mind, here is a set of Reading Group Questions for this novel. 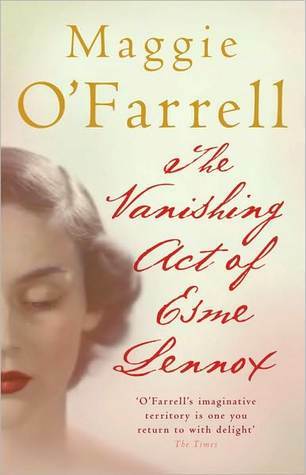 This review was written based on a copy of The Vanishing Act of Esme Lennox that I purchased. This was a 5 star read for me too. I do love Maggie O'Farrell's writing. Have you read The Distance between Us? I agree this is a great book club choice for discussion. I know this book got a lot of hype when it was published, and I do think I have a copy, but I never read it. I am glad I saw your review because I think I would love this book, and now I hope to pick it up soon! It sounds like it may even count towards RIP . . . what do you think? I have recently finished reading this myself and I liked it I will be posting my own review soon. Thanks for your review, I do not see the similarity to Rebecca though. This sounded good to me from the first time I heard about it! Thanks for the great review - definitely worthy of being added to my TBR list!